Find all the power tool accessories you need to get the most out of your power tool kit with the range below. Find what you need and stock up today! 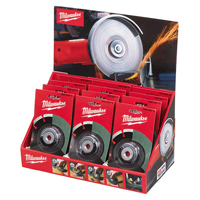 Featuring cutting discs, pin wrenches, water pumps and much more, you’ll find everything you need in the range above to make sure your power tools stay working as efficiently as possible. Whether you need to replace a drill bit, or update your grinder disc, you’ll be up and running in no time with our selection of accessories. At Euro Car Parts, we feature only the best brands available in our collection, which is while you’ll spot top names such as Milwaukee in the collection above. As well as providing an excellent range, we also provide free UK delivery on the majority of our items, and a free click and collect service that’s available to any of our over 200 branches up and down the country. Browse the full range of power tool accessories in the collection above, and don’t hesitate to get in touch with us if you need any assistance in making your purchase.